Today I racked the Traminette off of the gross lees into a 5 gallon carboy. The new 5 gallon carboy was first cleaned and sulphited, and then I removed as much oxygen as possible by sparging it with Nitrogen. I added a little potassium metabisulphite to increase the SO2 levels and protected from oxygen. And lastly, I added some Biolees, which tends to enhance fruit flavors, and round out any rough edges to the wine's acidity. Even this young, the wine has a fantastic aroma and taste! I think this wine is going to turn out very nicely. A few fellow winemakers asked about my impressions of Walker's Wine Juice. Thus far, I would definitely recommend their product. Initially, I was a little concerned about the wine quality given the fact that they use heat pasteurization to stabilize the juice. So far, I would say it doesn't affect it at all. While in the cellar, I checked in on the aging wines. First up was the Zinfandel. This Zinfandel is from Brehm Vineyards. The grapes originated from the Dommen Vineyard in the Russian River Valley in California. The Dommen Vineyard Zinfandel vines were planted in 1937. Talk about old vines! I received the frozen must in December of 2009. The must was originally 24.5o Brix, with a pH of ~3.34. I used D-254 yeast on this one, because I like a jammy-style Zinfandel. This wine should turn out to be about 13.5% alcohol by volume. I tasted the wine, and it is very fruit-forward right now, with a hint of spice in the finish. I am planning on moving this wine to the barrel next month. 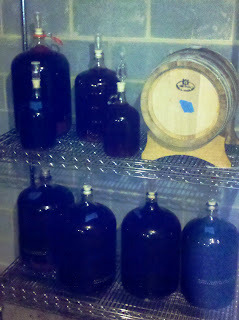 The Zinfandel has already completed malolatic fermentation, but I think it needs a little more oak flavor. To protect the wine, I added some potassium metabisulphite. Next I checked on a Cabernet Franc (NC grapes)/Cabernet Sauvignon (CA grapes) blend I have aging. The Cabernet Franc grapes were from 2008, harvested from Stony Knoll Vineyards in the Yadkin Valley appellation. I crushed/destemmed these grapes myself, and they were about 21o Brix. I fermented the must with RC-212 yeast. The Cabernet Sauvignon came in the form of a frozen must I purchased from Midwest Supplies. The CA grapes were harvested back in 2007, from the Rancho Sarco Vineyard in Napa Valley. I thawed the must and started fermentation back in March, with the D-254 yeast. The original numbers on this must was 25o Brix, and a pH of 3.95. I added tartaric acid to decrease the pH of the Cabernet Sauvignon to about 3.65. This blend was more of a blend of necessity with the lack of containers on hand, and not enough of either wine to fill the carboys I had in stock. This wine also is tasting great, very fruity, with a nice acid balance. Finally, I checked the 2008 Syrah, currently in the Vadai barrel. This wine definitely tastes like it has finished malolactic fermentation (MLF). These grapes also came from the Stony Knoll Vineyard in the Yadkin Valley. Originally, I had bottled the wine earlier this year. But I realized after tasting it, that not all of the wine had undergone malolactic fermentation. Back in June, I uncorked all the bottles and poured them into the barrel to allow MLF to finish. Since I am planning on bottling this wine next month, I will run a test soon to make sure it has completed. 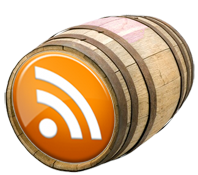 I learned about the paper chromatography test at the 2010 Winemaker Magazine Conference. To test, a drop of wine is placed on a special type of paper and it soaks up a chemical reagent. After it dries, it makes a color streak that gives reference points which indicate whether or not malic acid is still present in the wine. I'll post pictures of what it looks like later on. Overall, I am feeling positive about the work going on in the cellar. And in August, a work sink will be installed in the cellar which means no more carboys up and down the basement stairs. Just in time to be ready for fall harvest. Very nice. I love a detailed cellar report!!! But I'm a wine nerd, what do I know?